Mannesmann, along with his brother, developed the process for manufacturing seamless pipes. While the Mannesmann family was very adept technically, they lacked the business ability to successfully operate their own business without outside help. They relied upon the financial strength of the Deutsche Bank and a number of wealthy and intelligent businessmen to insure the financial success of the company. Moving from Berlin to Dusseldorf in 1893 the Mannesmanns built a large and modern rolling mill enabling them to produce a better quality product. Dividends were not declared on the young company's stock, however, until sixteen years later. Today, Mannesmann is one of the great German companies with far reaching interests including a still strong position in the pipe industry. 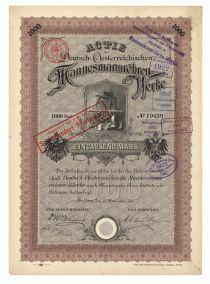 Mannessmann's is a truly important autograph from German industry, and one of only a very few German industrialists whose autograph is available on stock certificates. 1890, Germany. Stock certificate for 1,000 Marks Brown/Black. Vignette of various kinds of pipes and piping. The basis for this enterprise, founded in 1890, was a process developed by the Mannesmann brothers for the manufacture of seamless pipes. Today, Mannesman is one of the great German companies with far reaching interests including a still strong position in the pipe industry. The bold signature of MAX MANNESMANN (1861 - 1915) appears next to the facsimilie of Werner Von Siemans. This is a truly important German Industrial Autograph and one of only a very few German Industrialists available on stock certificates. Choice condition. Stamp cancelled.